Let me start by emphatically stating I am NOT comparing two players. I am merely comparing their rookie statistics. I feel this necessary due to some of our avid readers occasionally missing a key word or phrase in an article and thinking I am making a ridiculous comparison. The comparison between Jayson Tatum and Steph Curry in the tweet below is for the first 43 games of each player's rookie year. 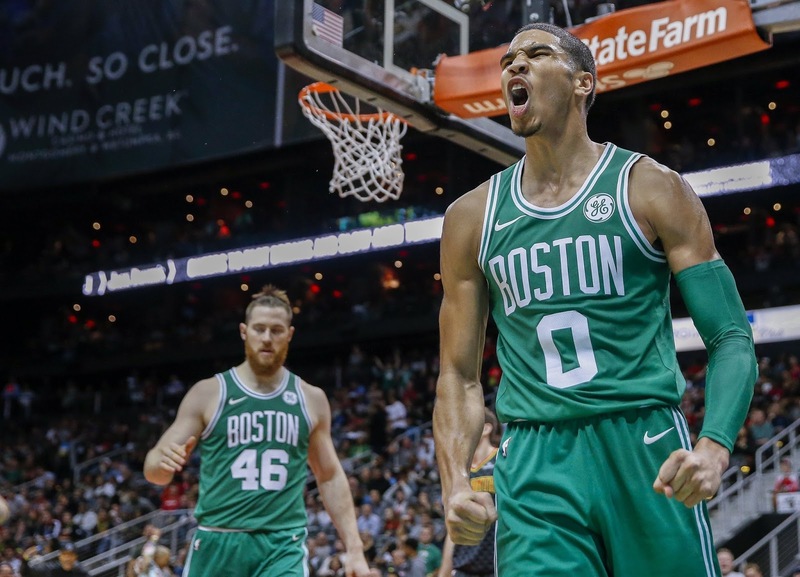 Is Jayson Tatum going to be better than Steph Curry? Curry's numbers increased in the second half of his first year in the league, and he ended up averaging 17.5 PPG for the entire season. Steph plays point guard for the Warriors, possibly the only position on the floor that Jayson may never play. Tatum also stands five or six inches taller and plays a different game than Curry. But the point is Tatum's first-half-of-the-season numbers are very encouraging. Curry is only one of many former rookies who have thrived in their rookie seasons and went on to stardom in the NBA. A solid early rookie season isn't a sure predictor of future stardom, but it is a strong indicator. One other point. Steph came into the League at 21 years old while Jayson came in at 19. Here is NBCSports' Max Lederman on the comparison. Due to his size, position, and ability to take off for a layup from the 3-point line, most people compare Tatum to Curry’s teammate Kevin Durant. While there is some validity to that argument (If Tatum attempted the same amount of shots KD did his rookie year he’d be averaging 25 ppg (KD only scored 20 ppg his rookie year . . . just saying), the shooting and scoring numbers look more like Curry. At the end of the day these numbers don’t guarantee Tatum will be a future MVP and/or a four-time scoring champion. However, at this point he’s at least a lock for the Hall of Fame. Coming into the League two years younger than Steph Curry and putting up these numbers is another indicator that Jayson is the most promising Celtics rookie since Paul Pierce. And the Celtics picked him up on the best two-for-one deal since Red Auerbach brought in Kevin McHale and Robert Parish for Joe Barry Carroll, often viewed as one of the greatest busts in NBA draft history. The fact he was called "Joe Barely Cares", according to Wikipedia, would be an indicator of that fact. Danny Ainge learned well from his mentor, Red Auerbach. Now, what are we going to do with that Lakers pick?